David Marion is responsible for business strategy, investment strategy, and client development and relations. David co-founded Santa Fe Advisors in April 2014 along with partners Kristina Alley and David Kantor, with whom he previously worked at First Santa Fe Advisors. 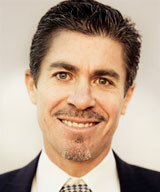 David joined FSFA in June 2011, where he served as Senior Managing Director and Chief Investment Officer. Previously, David spent 18 years at JP Morgan in both Chicago and New York. While at JP Morgan, David worked at both the Investment Bank where he specialized in covering large institutional investors for alternative credit assets, and in Private Wealth Management where he managed client relationships and advised on asset allocation and balance sheet solutions. David is very active in the Santa Fe community where he serves on multiple boards, and enjoys pursuing interests which include his family, fine wine, and outdoor activities such as cycling and trail running. David has a BS in Finance from Texas A&M University and an MBA from Pepperdine University. He is a CFA® Charterholder.